Welcome to the Blue Hen family! Students’ transition to college can be both exciting and stressful. Our optional family orientation program provides parents, family members and guests with an overview of campus resources and chances to ask questions about vital academic information, the value of student engagement, living on campus or commuting, health and safety, paying the bill, dining, and more. All incoming students are welcome to register a parent, family member or guest to attend the UD Family Orientation program that takes place during their orientation day. Parking for NSO [PDF] for new first year and transfer students is only available in Trabant Garage, adjacent to Trabant University Center. The Trabant University Center is located at 17 West Main St., Newark, DE 19716. Orientation is mandatory for each new student. A one-time $230 fee will appear on your student’s first semester bill regardless of program attendance. More details are available on our Orientation page. 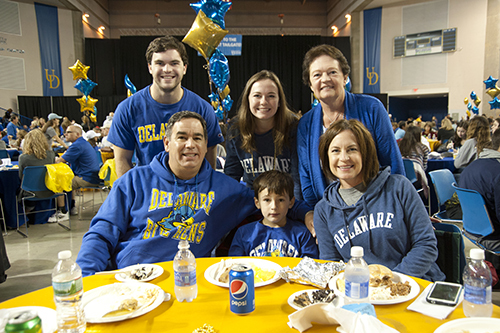 All parents, family members or guests who wish to attend orientation must be registered on your student’s New Student Orientation (NSO) Registration Form, found within their My Blue Hen Home portal. The nonrefundable event fee per guest is $35, payable online by credit card or check. Students may add family members or guests up to 3 business days prior to their NSO date. After that time, call 302-831-3313 or email otp@udel.edu to add guests. There is no fee for guests under the age of 10; however, NSO is not appropriate for siblings and young children as the program is designed for new college students and parents. Additional links that may be helpful to your student during their transition to the University of Delaware can be found in the Resources section. We’re excited that your student has chosen the University of Delaware, and hope you’ll keep in touch by subscribing to UDaily. Details on Parents and Family Weekend, student successes, and new initiatives will be shared here throughout the year.